I like the fact that there are chef-driven restaurants if you want to go that route, but there are also lovely little ethnic neighborhood restaurants that are just as good in their own right, so the possibilities are endless. avec: The dates with the chorizo. Fat Rice: The rice noodles with the XO sauce. Delicious! Lula Cafe: Farm Dinner Mondays or anything on the special card. The Publican: Either the ham “in hay” or the farm chicken with sausage. Sweets are your specialty. Are there any restaurants in Chicago where you always leave room for dessert? If you had to name one personal favorite dessert at your dessert bar, which would it be and why? 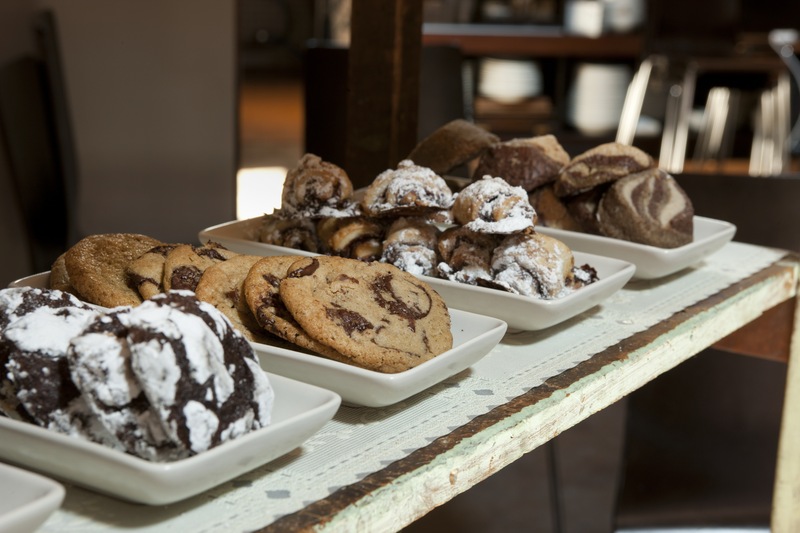 Cookie selection at HotChocolate. Credit: Scott Shigley. The desserts change all the time, but I always like the cookies. There are always 12 types, they’re always different, and we bake them fresh everyday. What cuisines do you most enjoy eating and cooking? I love cooking peasant food, anything that’s really simple. I love eating Italian food and Chinese food: Italian for its simplicity, and Chinese because I’m Jewish and grew up eating it. It’s comforting. What’s one dish in Chicago that blew you away and left you wishing you came up with the recipe yourself? The Chicago popcorn combination: cheddar and caramel corn. That’s tough, but maybe Chinatown? I love the diversity of all the different restaurants and different flavors you can get: Szechuan, Cantonese, Mandarin. I love it – you can have different Chinese food every night. It’s also fun to go with a group of people. We have to ask: what’s your favorite Chicago deep dish? I don’t eat deep dish, but if I did, I would go to Pequod’s. 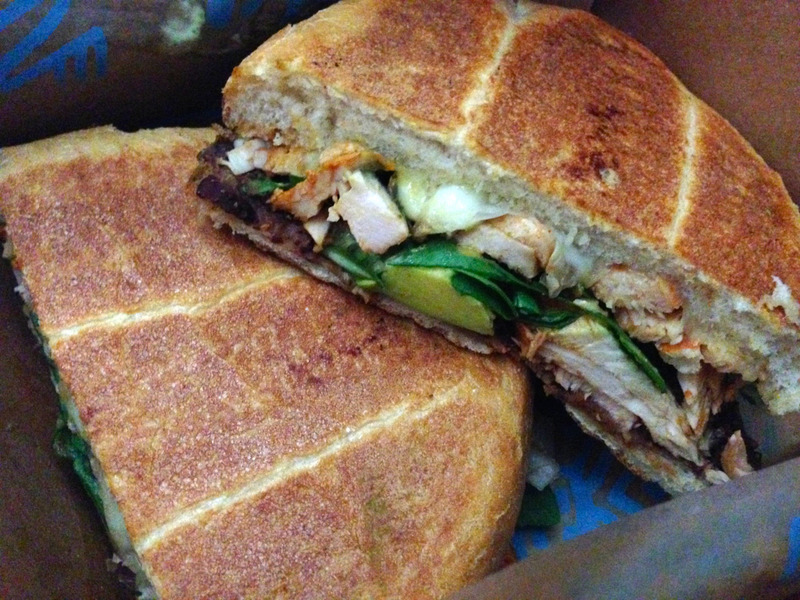 I really like Rick Bayless’ Tortas Frontera restaurant in Terminal 3 at O’Hare. What’s your guilty pleasure and where in Chicago do you go to get it? My guilty pleasure is BBQ pork fried rice with extra bean sprouts and an addition of fresh broccoli from Lee’s Chop Suey. Add an egg roll in there, too. My husband doesn’t really like Chinese food, so I eat it behind his back. I dream about it – it’s so delicious and decadent. When I first get it, it’s too hot so I leave it open – I like to eat it at room temperature – and I end up grazing on it all night long. With the fresh broccoli, it’s SO GOOD. I don’t need anybody but my BBQ pork fried rice. Sometimes I take the egg roll and I unroll it and I put the insides into the pork fried rice. Do you have any favorite watering holes? I love the Map Room. I go there every morning for coffee, and my husband goes there every night after work. Their beer selection is unbelievable. I also like Scofflaw; their cocktails are fantastic. Usually I always get the Scofflaw Swizzle. They also have really good food. Are there any foods native to Chicago that you particularly like? Do an architectural tour or a tour of Graceland Cemetery. It’s beautiful and it gives you an idea of all the great people that shaped this city. HotChocolate Craft food and drink, 1747 N. Damen Avenue (Bucktown); contemporary American, pastries and desserts, breakfast Tuesday-Friday, lunch Wednesday-Friday, brunch Saturday-Sunday, closed Monday. avec, 615 W. Randolph Street (River West); Mediterranean, dinner daily, brunch Sunday. Urbanbelly, 1400 W. Randolph Street (West Loop); Asian, lunch and dinner daily. Fat Rice, 2957 W. Diversey Avenue (Logan Square); Macanese, dinner Tuesday-Saturday, brunch Friday-Sunday, closed Monday. Lula Cafe, 2537 N. Kedzie Boulevard (Logan Square); new American, breakfast, brunch, dinner and late nite Wednesday-Monday, closed Tuesday. The Publican, 837 W. Fulton Market (West Loop); American, dinner daily, brunch Saturday-Sunday. Nico Osteria, 1015 N. Rush Street (Gold Coast); Italian, breakfast and lunch Monday-Friday, dinner daily, brunch Saturday-Sunday. Blackbird, 619 W. Randolph Street (River West); Midwestern/American, lunch Monday-Friday, dinner daily. Pequod’s Pizza, 2207 N. Clybourn Avenue (DePaul); Chicago-style deep dish pizza, lunch and dinner daily. Tortas Frontera, Terminals 1, 3 and 5 at Chicago O’Hare International Airport (ORD); Mexican, breakfast, lunch and dinner daily. Lee’s Chop Suey, 2415 W. Diversey Avenue (Logan Square); Cantonese, lunch and dinner daily. Map Room, 1949 N. Hoyne Avenue (Bucktown); coffee shop and bar, open daily. Scofflaw, 3201 W. Armitage Avenue (Logan Square); cocktail bar, open daily. Graceland Cemetery, 4001 N. Clark Street (Graceland West); various tours available during spring, summer and fall months. About the Chef: “I couldn’t do anything else – I wasn’t good at anything else. I’m not joking!” Chef Mindy Segal proclaims when asked where her passion for making pastries stems from. After graduating from Kendall College’s culinary arts program, Segal worked her way through some of the most renowned restaurants across the country: Spago, Charlie Trotter’s and mk, to name a few. In 2005, she ventured out on her own with Mindy’s HotChocolate, a restaurant and dessert bar in Chicago’s Bucktown neighborhood that quickly built its reputation not just on its sweets, but its savory dishes, too. Two years later, Segal earned her first nomination from the James Beard Foundation for “Outstanding Pastry Chef” in the country. She would be nominated four more consecutive years before finally nabbing the award in 2012. For her, this honor meant anything but resting on her laurels.